Warriors are melee characters in MapleStory that boast largest amount of HP out of all adventurers, as well as the highest defense (especially Pages). There are three main types of Warriors: Fighters, Pages, and Spearmen; each having their own pros and cons. Warriors have a huge amount of HP; up to twice as much as the other adventurers, and Spearmen even more so with their skill "Hyper Body". Warriors have the strongest armors in the game in terms of defense. For example, the level 60 Warrior helm has twice as much defense as the level 60 Magician helm. Fighters and Pages also receive the skill "Power Reflection/Guard", which nullifies some of the damage they receive and reflects it back to the enemy. Because of their high damage, HP, and DEF, Warriors can hunt some higher level monsters more easily. Warriors are able to "tank" most monsters. Warriors can easily take down monsters fast. Other classes such as Bowmen and Assassins attack long-ranged, meaning that they would be able to kill monsters more quickly than Warriors. This can also lead to Warriors being KSed often in early levels. Because Warriors have to get up close to the monsters to kill them, they usually end up being hit more often. Therefore, they tend to spend more Mesos on potions. Warriors can wear equipment such as the Jousting Helm that hides the entire head. Even though these helmets are high in defense, any NX Cash that was spent to improve facial appearances are sacrificed to some degree unless more NX Cash is used to cloak the helm. There are little to no high leveled helmets like this however. Because Warriors are melee characters and get hit often, low-leveled Warriors spend a lot on HP potions. However, they make up for it later in the game as their defense grows. So you want to be a Warrior? Enter the game, complete the tutorial, and voilà! You can now fight with Snails and other monsters. Maple Island is a breeze. Complete Pio's quest for The Relaxer because its a way to heal with out using pots. Just sit at a place where a monster won't hit you and you will heal 50 health every 10 seconds. Keep training until you reach level 10, then head to Southperry and head off to Victoria Island to finally become a Warrior! Once you hit level 10 and rush your way off to the town of Southperry, talk to "Shanks" and pay the 150 Mesos fee (or complete the quest to get there for free) to teleport to Victoria Island. Once there, jump off the ship and move to the right of Lith Harbor to see the taxi. Talk to the taxi and you will be able to go to any town in Victoria Island, with a small fee. Go to Perion and head to the bottom right. Head inside to the tent and speak with "Dances with Balrog". You will be upgraded to your first job class, your stats will improve, you will unlock a new set of skills, and you now have access to Warrior exclusive equipment. You should read up on some of the builds available to you. Once you've hit level 30, you first need to talk to Dances with Balrog. He will tell you that you look stronger and ready for 2nd job, and will send you to a testing area. At the test area, you will be fighting Skeledogs for 30 Dark Marbles. They don't give any experience or drops except for the Dark Marbles. Once you are done, exit the map through the portal. Hand the 30 Dark Marbles to the Dark Lord, and you will be able to make your decision to either be a Fighter, a Page, or a Spearman. Once you are level 60, go to El Nath, and head to the house on the big hill (Chief Residence). Head to Tylus, and talk with him. After a chat, head to Sharp Cliff I. Go inside the crystal portal at the bottom of the map. Double click on the Holy Stone at the bottom. Head inside, fight Dances with Balrog's evil side, and head out with the Black Charm that it drops. Head back to Tylus and give him this item, and voila, you are third job! Congratulations on hitting 100! Once you hit level 100, Tylus the 3rd job instructor will contact you via lightbulb. After starting the quest, head to Leafre and talk to Harmonia in The Forest of the Priest. You will then get a quest to obtain two special items for the fourth job instructor to advance. You will have to kill Manon and Griffey to get the two items, but thankfully, they're special versions of the bosses, which you will find instantly upon entering their respective boss map. Note, they don't drop any of the items the real versions do. After hunting down these monsters and obtaining the two items, go talk to Harmonia. She will advance you to fourth job, give you the skill book for Maple Warrior 10, and give you 4 SP and 5 AP. 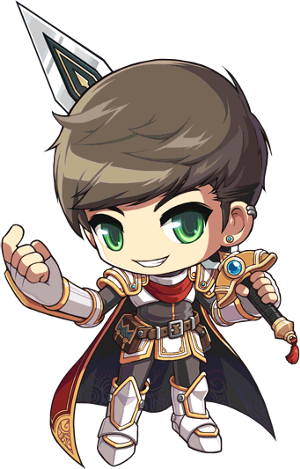 At level 50-70, Fighters gain Rage and become the most damaging class of all Maple Story and Spearman catch up with the ability to use Hyper Body and the fact their damage edge is becoming more significant. Pages, however, suffer from the mediocrity of Threaten, and become the weakest link of the Warrior family. At level 70+, you will receive your 3rd job advance. Dragon Knights become MUCH faster with Spear Crusher, and though they do not do massive damage in a single hit you do lower damage spread out over A LOT of hits, Crusaders will be known for doing MASSIVE damage from here on, once you've leveled up Combo and preferably Panic over Coma. Crusaders, as they use mainly swords (axes on fewer occasions but they do fine if you use axe booster) which are faster then blunt weapons (Swords can be used too, for more stable damage, and more damage over time, with a better speed) and spears and pole arms, all of these weapons are slower then swords making for faster kills, and swords have the most reliable damage of I think any weapon in the game. This makes most Crusaders both faster AND stronger then other classes. Now pages,(finally) though they are not known for massive damage they have one thing that would make any Crusader or Spearman A LOT stronger...elements. (Although they do have elements, you will need to be a very high level, like 90+, to have all elements maxed out) Pages have the ability to attack with Fire, Ice, and Lightning. This means that if they find themselves in a situation where they are surrounded by monsters weak to fire they can whip out their fire attacks, if the situation changes to ice-weak monsters they can quickly adapt to the change. Plus, ice charge freezes the enemy for a second or two. They also have Magic Crash which will allow them cancel out Magic Defense. With the exception of Spearmen, it's strongly recommended that you stick with one weapon. Spearmen can choose to either stick with one weapon or go hybrid, meaning to master both weapons. Spearmen can choose to use either spear or pole arm. If you're a person who wants to kill a large number of enemies in half the amount of attacks that it would take to solo them than go for this job. If you're a person who likes to solo monsters instead of going as a party, then this job is for you. Jump attacking: Jumping over a small monster while attacking it, then proceeding to attack it from its behind is a good way to avoid bumping into it. One must always take note, however, of the terrain and position of other monsters so as to not take more damage than is necessary. Knowledge of enemy skills and habits: Know your enemy! Certain monsters have certain skills and attack patterns. Ghost Pirates and Dual Ghost Pirates don't use their unavoidable magic attack when you are on level ground with them a short distance away. Therefore, it would be wise to not jump around while attacking while staying close to the monster. Grim Phantom Watches only use their ice attack when they are facing left. Attack them from the right! It is knowledge that differentiates a good warrior from an average one. Knowledge of terrain: If there exists a spot on the map which allows you to attack your enemy while not getting hit, why not use it? Use appropriate pots: Use pots appropriate for your HP/MP. Smaller pots usually have better meso/HP or MP ratio. Good MS players should seriously consider pots sold in New Leaf City, which for warriors and mages quickly become much more cost efficient than potions sold anywhere else. Master HP Increase Mastery as soon as possible. This will slow your training at first but it will increase your HP. Then by level 30, you will have about 1,500-1,600 HP. This applies to both normal warriors and HP warriors. If you do not decide to master it soon, you will lose about 500 HP. Some say Final attack has the flaw of activating unexpectedly, sometimes at the wrong time. However, this helps you quite a lot. It speeds your training speed by a margin. Most of the warrior classes are basically the same during 2nd job. All of them use Power Strike and Slash Blast as their main attacks. Basically the differences can be summed up in two areas: skills and weapon choices. The main skill difference is that Fighters get Rage, which boosts your party's weapon attack by 10. During 2nd job this is strongly appreciated, as it is free (except for -10 wep def, which is not going to impact the damage you take much at all), takes no Use slots and increases each party member's damage (except Mages) by several hundreds. The other classes can give themselves a weapon attack boost as well, but need items to do so. Fighters also get Power Guard, reducing touch damage by 40% and deals it back to the monster. This is the main reason why Fighters/Crusaders are considered soloers is because this reduces pot costs immensely. Pages get Threaten, a skill that lowers the enemies' weapon defense and weapon attack by 20; this is mostly used to lower damage dealt to you. Pages also get Power Guard, reducing touch damage by 40% and deals it back to the monster. This is one of the main reason why Pages/WKs are considered soloers is because this reduces pot costs immensely. Of course, constant KB and Ice Charge helps also to the soloing factor. Spearmen get Hyper Body, which boosts your max HP/MP and that of your party by 60% when maxed. This skill is particularly useful for helping partied Thieves, Archers, and Mages to survive more hits from enemies and/or PQ bosses. They also get Iron Will which gives +20 wep def and +20 mag def for 300 sec. It is basically a nerfed Bless with 100 seconds more duration but gives no accuracy or avoidability bonus. Even with this skill maxed, it isn't even close to being in the same league as Power Guard and is why Spearmen/Dark Knights are not considered a soloing class. The other difference is weapon options. Fighters and Pages can both choose between unstable weapons with high max damage, stable weapons with higher min damage, fast weapons, slow weapons, long reach, short reach, etc. Spearmen get weapons with the highest maximum damage, but lowest minimum damage, and with the longest reach but (with a few exceptions) the slowest attack speed. All 3 jobs have some sames and differences in their skills. Spearmen use hyper body, which can also be dispelled, which causes confusion for thieves and bowmen who end up dying from their low hp. Fighters have rage which is very useful but can also be dispelled. It's a very useful skill as some people may get annoyed if you don't use it like it's a precious item. Threaten has to be recast every several monsters and doesn't effect bosses. All though it could be useful for mages since they don't have very high weapon defense and it sorta works like rage since it drops the weapon defense of the monsters. Threaten is pretty much useful for training only. As a Crusader, you will eventually learn two new major attacks: Coma and Panic, the two strongest individual attacks in the game(aside from 4th job). Each of these is very powerful, but requires that you charge up a "Combo," similar to fighting games, meaning that you can only use these once every several attacks, and the rest of the time you use weaker attacks. You build this combo by using other attacks, such as Power Strike or Slash Blast. Each time you hit with something, you charge an orb. Each orb adds to your power, until you use either Coma or Panic, which releases the orbs. This results in several smaller hits, leading up to one very powerful hit. Crusaders are also something of a "balanced" class in that their skills are equally suited to both soloing and partying, no matter what they're fighting. If you like seeing big, 5-digit individual numbers appear on your screen, this is your class. Crusaders, after level 100, deal the most total damage over time on single targets, bosses, and large mobs, as long as the monster they're hitting isn't weak to any elements. Crusaders continue to use Power Strike as their main attack. Each time they hit with it, they charge an orb on their Combo. The orbs will add to your damage with each hit. You can also use a new attack called Panic, once you have a certain number of orbs charged. Using Panic resets your orb count to 0. Crusaders deal the most damage to single monsters overtime compared to the other Warrior Classes. But, if the monster is elementally weak and a WK can benefit from this, then the WK will win in overall damage. This advantage doesn't really show unless the monster has a lot of HP (Primarily Bosses) due to constant Charge Up to Finisher playing style. Based on inefficiency of FA on mobs and range, Crusaders and WKs are both less effective in mobs of 5 and 6 monsters in comparison to DKs, though FA has the same range as Fury. Coma also has the same range. Though the total damage that will be dealt by FA is 250% which is close to another Power Strike, if dealt to other monsters, it divides that 250% disproportionately. The FA damage divided up with a mob of 6 is "1.67*, .56*, .18*, .06*, .02*, .006*." This seriously hinders overall damage while DKs do not have to worry with such inconsistency through Fury/Buster. Also, they don't have to worry about KB as much. The 2nd monster will only receive around 34% of the damage the 1st monster received, the 3rd monster will only receive around 32% of the damage the 2nd monster received, and so on. This seriously hinders keeping a mob at bay to reduce pot costs. That is why such Defensive Tactics are noted as follows. Crusaders have several gameplay tactics they can use defensively. For instance, they can use Coma with less than 5 orbs to stun enemies at any time, as long as they have at least one orb charged. This becomes key when dealing with large mobs to minimize pot costs. Such a method is as follows: Stun the mob with coma (No matter the number of orbs), then Power Strike a single monster repeatedly. Then, with 5 orbs, or if needed to keep control over the mob, stun the mob again and repeat. This is a very useful skill that many crusaders use which helps soloing. At higher levels, Crusaders also get Shout, an attack that stuns an enemy (95% chance) within a certain area, including those above or below you. It lasts a full 10 seconds with the skill maxed, unless the stun is interrupted. Rage provides a free 12 weapon attack boost for a party of 6. They are also very fast killers at big mob spots like Himes, and their specific tactics also rack up fast experience at Gobies. Because many characters use stronger attack boosts when bossing, their party skill, Rage, is often not considered as a factor. Crusaders are mainly used in bossing parties for their damage-dealing; on single elementally neutral monsters, Crusaders rack up the most total damage per minute of the warrior classes, and the second most at elementally weak bosses. Crusaders suffer against bosses that Dispel constantly, since this can eliminate their charged orbs. Crusaders can choose from a variety of weapons. They can choose axes for low scrolling costs resulting in high weapon attack, but unstable damage, or swords for high costs but stable damage; they can choose 2-handed weapons for slower attack speed but higher damage per hit, or 1-handed weapons for faster attack speed but lower damage per hit. One weakness of Crusaders is that their skills result in a string of unstable damage. Against some monsters, this can result in wild damage variety, causing knockback issues in some cases compared to the stable damage of White Knights. Also, Crusader's stun is interruptible, meaning if you were to hit the stunned monster after using coma/shout on it, it will become unstunned. This can be quite irritating dealing with a large mob around you. If Power Guard is on, bumping into the stunned monster will cause it to become unstunned. Crusaders also take a long time to master their attack skills, as they spend many levels mastering Combo first. White Knights are patterned around two main areas: elemental attacks and defensive tactics. Their ability to use Fire, Ice, and Lightning charges makes them very strong against anything weak to those elements, outdamaging the other two classes over time and providing steadier knockback, although they deal less damage over time against enemies not weak to an element. Additionally, they can freeze and stun mobs; combined with Threaten, this provides them with a good balance of defense and offense that makes them the game's premier solo class. For WKs, though the holy element wont be available until 4th, the only things set in stone about elements are that fire is good against ice, ice against fire, and holy against undead. For the rest, lightning is good against some fire monsters and some water monsters. This steady string of damage results in more damage over time on a single target than Crusaders or Dragon Knights, as long as the monster is weak to fire or lightning. If not, Crusaders will deal more. They can also use Charged Blow, which deals base 250% damage to each monster in a mob, and stuns them; in exchange, you lose your elemental charge and have to use it again. Unfortunately, due to Slash Blast and Charge Blow being their only arsenal for mobs, they do the least damage overtime to mobs of 5-6 Monsters. FA hinders this also as explained under the Crusader Section "Damage on Mobs." Only in 4th job will WKs truly shine, being able to spam Charge Blow, but until then, they remain a great soloer and #1 on overall damage to single targets that are elementally weak. White Knights are very good at using tactics to avoid damage. Their second job skill, Threaten, reduces damage from any target; adding to the picture the ability to freeze with Ice Charge, or to stun with Charged Blow, also helps immensely. Charged Blow's stun, unlike that from Coma or Shout (Crusader skills), isn't interrupted when the enemy is hit. Finally, against any enemy with an elemental weakness, White Knights have the steadiest knockback of the three warriors, which helps to keep enemies at bay and prevents bump damage. Since they have no party skills, White Knights are usually soloists. They do sometimes appear in parties for training monsters weak to an element, though, such as Duals or Grims, at which they would be the fastest killers of the warrior classes. White Knights dish out the most damage per minute of any warrior class at Pianus, which is weak to Fire, and Black Crow, which is weak to Lightning. They see limited use at other bosses, such as Papulatus or Zakum, since they have no party skills and Crusaders dish out more total damage than they do at those bosses. But as an exception, high lvl WKs are recruited into Pap runs for their constant KB. Sword White Knight or Blunt Weapon White Knight? Both Swords and Blunt Weapons have their pros and cons, and the overall majority of White Knights are swords users. But, Blunt Weapons have their own Advantages as well. Very Popular Weapon. Warriors have always been associated with Swords. Swords have Stable damage, and will produce the same kind of damage constantly to monsters. Generally very expensive to buy, and to scroll. Rather commonplace weapon to use, about 85% of GMS who have a White Knight or Crusader use swords, which can generally be boring to some. Blunt weapons are stronger then Swords. Blunt weapon users are rare, and so being one of the few give you a certain degree of comfort. Very Inexpensive compared to Swords and to scroll. Blunt weapons have unstable damage, and so the amount of damage a White Knight will produce will be at random. Blunt weapons are slower then Swords, and this is why using them is generally frowned upon. Due to their lack of party skills, White Knights aren't often sought as party members (exceptions include Grims, Duals, etc from levels 80-100); however, since they have tactics suited to avoiding damage and killing fast, they are gods of soloing anyway. Against an enemy which isn't weak to any element, White Knights also dish out less damage than even a Crusader without Panic or Coma. Since the two fastest leveling spots in GMS (Himes and Gobies) are currently both neutral, this poses a difficult situation for very high leveled White Knights. Dragon Roar - 240% on up to 15 enemies; 3600% in total. Roar is rarely used because of its casting time and the fact that you become stunned for 2 seconds after using it; however, it's there. DKs, having two main attacks that are both mob attacks, do the most damage to mobs of 5 and 6 monsters overtime due to range and damage of Fury. Though Crusaders outdamage DKs on mobs of 5-6 monsters, due to range, DKs have a tendency to do better because they can hit more monsters easier. They are also superior in mobs of 2-3 with Crusher. Because a Dragon Knight's main small-mob and single-target attack, Crusher, is poor with knockback, they rely strongly on partying Priests to keep themselves from burning potions. However, they have defensive advantages to help. For starters, Fury is a very long ranged attack that can be used to kill mobs while running away from them. Additionally, Sacrifice can be used if necessary to help keep an enemy at bay. Also, using ER to reduce 40% of damage dealt by magic attacks and using long range tactics, the DK receives less damage. Of course, dealing with mobs usually ends up with taking touch damage. So it is debatable on exactly how much it helps. Dragon Knights are one of the game's most partied classes because of Hyper Body. This vital skill makes it possible for Archers, Mages, Bandits, and even Hermits to survive most of the strongest enemies' attacks, including those of bosses. Their mobbing skills, especially on both small and large mobs, also makes them desirable training partners, particularly at the game's currently most popular high-level training spot, Himes. See above for the benefits of Hyper Body. Dragon Knights are one of the few classes in the game that can provide vital support skills while still dishing out damage to a boss, even though their damage over time is somewhat less than the other two classes'. They are priceless for their contributions in bomb control. A constant 10k+ damage can save many in Pianus from the devastating 10k+ damage dealt when the blood booms explode. Also, Roar is used in Pap runs to explode the dark stars on the top platforms, thus neutralizing threats that can potentially deal 8k+ damage. Dragon Knights' weapons lose their 2nd job instability by using forced stab or swing attacks in 3rd job. Spears and Polearms also both have very long reach, but slower attacks. Combined with Crusher's slow skill speed, this is why Dragon Knights are outdamaged by the other two classes over time on bosses. However, Polearms are the only warrior weapon in 3rd job capable of hitting Zakum's top arms, which is just one of many benefits from their range. Spear Users will use Crusher to maximize damage output, which does the most damage to mobs of 2-3 monsters overtime. They tend to level faster in the early stages of 3rd job as their training spots have more mobs of 2-3 monsters. Polearm Users will use Fury to maximize damage output, which does the 2nd most damage to mobs of 5-6 monsters overtime and has greater KB capabilities than Buster. They tend to lvl faster in the later stages of 3rd job because their mobbing capabilities do well against Gobies and Himes. Hybrid users have the use of both weapons to use both Crusher and Fury to their full potential. Unfortunately, it tends to take longer w/o FA in 2nd job, and it sometimes costs more for Hybrids who have two weapons. As mentioned above, Dragon Knights have the lowest damage over time on single targets, but since training generally involves fighting mobs and they have Hyper Body for boss parties, they will always be a contribution in parties anyway. Additionally, since the strongest attack for knockback that a DK can use without sacrificing HP is an unbuffed Power Strike, their KB rates are much lower than the other classes, which causes them to generally take more damage from fast-moving enemies. Combined with a lack of Power Guard, this makes it very difficult for DKs to solo, but it can be done. DKs lvl 100+ with ER, HB, and NLC pots combined will eventually spend around the same amount of money on pots if compared to a Sader and WK if they both took the same amount of touch damage (Example: Himes). This page was last edited on 23 August 2013, at 17:09. This page has been accessed 470,375 times.